One wonders if sports organisations and their leaders give any serious thought to some of the statements they make. The latest baffling statement was by the FA of Malaysia in announcing key performance indicators (KPIs) for newly appointed national coach Ong Kim Swee, one of which is to improve Malaysia’s Fifa ranking from 171 to the top 140 within his two-year tenure. While his other two KPIs – qualifying for the 2019 AFC Asian Cup and winning the AFF Suzuki Cup – are realistic targets, lowering Malaysia’s ranking by 30 rungs is a tall order. Malaysia will have to play about 18 ‘A’ class matches and either win or draw to have a chance to meet the ranking target. And they will have to play teams that are from confederations that have higher rating points and that are ranked 150 and below in order to maximise their points. For starters, can Malaysia secure 18 matches within two years? Are there enough Fifa windows for approved friendly matches? Will teams ranked 150 and below be prepared to play Malaysia? As far as Fifa-approved matches are concerned, Malaysia have just an away match with Saudi Arabia in the 2018 Russia World Cup qualifier in March. With Malaysia having no chance of continuing their progress to Russia by moving into the third round of AFC qualifications, the focus for Ong will shift to seeing the national team book their place in the 2019 AFC Asian Cup in United Arab Emirates. With 12 top teams in the Asian World Cup qualifiers booking their places in the Asian Cup, another 12 spots are available through qualifiers for 24 teams, including Malaysia. The draw for the Asian Cup qualifiers have not been made yet but the 24 teams will be drawn into six groups of four teams playing their qualifiers until 2018, with Malaysia playing six matches (home and away) in their attempt to finish among the top two in the group to make the cut. With one match from the World Cup qualifiers and six from the pre-Asian Cup tournament, Ong will have seven matches in hand. Can Malaysia win or draw the seven matches to gain points for an improvement in their ranking? 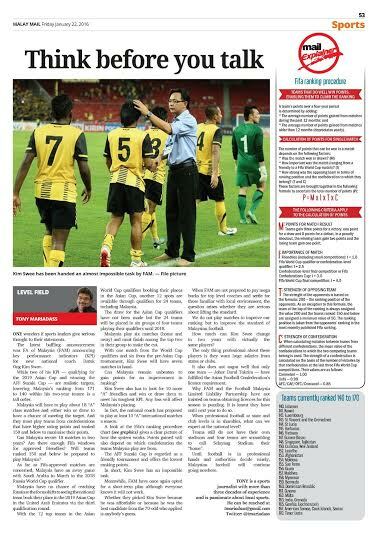 Ong also has to look for at least ten more 'A’ friendly matches and win or draw them to meet his toughest KPI. Note that any loss in these matches will affect Malaysia’s current ranking. In fact, the national coach has proposed to play at least 10 ‘A’ international matches in a season. A look at the Fifa ranking procedure chart (see box) gives a clear picture of how the system works. For example, points gained will also depend on which confederation the teams that Malaysia play come from. The AFF Suzuki Cup is regarded as a friendly tournament and comes with the lowest number of ranking points. In short, Ong has an impossible task. Meanwhile, FAM have once again opted for a short-term plan to improve Malaysian football, although everyone knows it will not work. Whether FAM picked Ong because he is affordable or because he was the best candidate from the 70 odd who had applied is anybody guess. When FAM are no prepared to pay big bucks for top level coaches and settle for coaches who familiar with local environment, again the question of whether the national body is serious about uplifting the standard arises. Put simply, we do not play matches to improve our ranking but play matches to improve the standard of Malaysian football with a long-term goal. And when we play friendly matches, we have to take into account the condition, strength and peak performance of the team. We cannot play top-level matches all the time because losses will only worsen our ranking. How much can Ong change in two years with virtually the same players in the pool, not to mention players who lack professionalism? The only thing professional about these players is that they want huge salaries from the states or clubs when playing in the M-League. It also does not augur well for the M-League that only one team – Johor Darul Ta’zim (JDT) – have fulfilled the Asian Football Confederation's (AFC) licence requirement before competing in its club competitions. Why FAM and the Football Malaysia Limited Liability Partnership have not insisted that teams competing in the M-League obtain licences for the current season is equally puzzling. It is learnt that they have been given until 2017 to do so. When professional football at the state and club levels is in shambles, what can we expect at the national level? Teams still do not have their own stadiums and four teams are scrambling to name the Selayang Stadium as their home venue. Until football is in professional hands and the authorities of the game make wise decisions, Malaysian football is going nowhere. The logic of these calculations is simple: any team that does well in world football wins points, enabling it to climb the world ranking. · The average number of points gained from matches older than 12 months (depreciates yearly). The strength of the opponents is based on the formula: 200 – the ranking position of the opponents. As an exception to this formula, the team at the top of the ranking is always assigned the value 200 and the teams ranked 150th and below are assigned a minimum value of 50. The ranking position is taken from the opponents’ ranking in the most recently published Fifa/Coca-Cola World Ranking.